What is it that separates those who catch trout in moving waters from those who don’t? Generally speaking, it isn’t casting skills, better equipment or the ability to “match the hatch”. It’s quite simply knowing how to read the waters they’re fishing and, as a result, they spend considerably more time playing those parts of the stream that hold fish than those that don’t. I recall many years ago fishing the Cardinal River for cutthroat trout with the publisher of the annual Alberta Fishing Guide, Barry Mitchell. 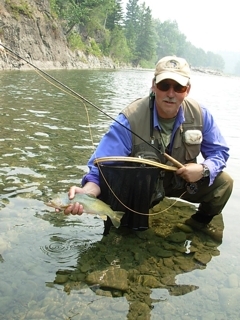 Barry’s skills as a trout fisherman are renowned, and he knows the Cardinal intimately. I approached our day on the water from the perspective of a student, keen to learn from a master. And learn I did, about cutthroats, and advanced casting techniques, and a variety of other topics. Much, I suspect, I’ve forgotten, as you tend to do when you’re supersaturated with new information. But the one lesson I took away that I’ve tried to put into practice from that day forward could best be summarized as “fishing where the fish are”. The concept sounds obvious, but what does it really mean when you’re on the water? In Barry’s case it meant ignoring everything but the best stretches of water. In some cases we walked hundreds of metres between casts, turning a cold shoulder to water that I normally would have poked and prodded in hopes of rising a trout or two. The result was that more time fishing the best water and less time fishing marginal water translated into greater numbers of fish hooked for us. Understanding what constitutes quality trout habitat means understanding their requirements when selecting a “lie”. 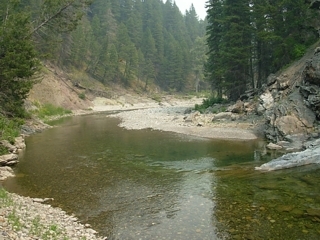 Trout will select for three features – relief from strong currents, protection from predators, and easy access to food. Survival and growth for them means getting the most food with the least effort while minimizing exposure to danger. The very best lies will have all of these characteristics, but more often trout will change lies through the day to meet one or more of these requirements. It’s not often that trout will “hunt” for food. Most often they let it come to them. The nature of streams is that they are natural conveyor belts, drifting a steady flow of food downstream, and trout position themselves to best intercept what’s on the menu. The strongest currents generally carry the most food. In the majority of streams, trout will move out into these fast water lanes at some point through the day. Current velocity will dictate how long a trout will stay in any given lane. Too fast and the trout expends more energy fighting the current than it receives from the food it consumes. Often the best choice feeding locations are in moderately paced currents. Pools -Pools are easily identifiable in most streams, and are characterized by deeper, calmer water. They’re most often found below natural drops in the stream, or where the stream bed takes a significant turn. Pools themselves can be subdivided into three broad sections – the head, the center and the tail. While the centre of the pool often looks the most inviting to the angler, it’s the area least used by trout because the calm waters of the centre expose trout to danger, particularly from above. Trout will most often position themselves in the centre of a pool only when there is an active hatch occurring, and even then they will generally wait until dusk before taking the risk. The head of a pool is often a choice trout location. Typically it offers natural escape from currents. Water tumbling from above into the pool creates protection from the eyes of predators, and a trout positioned at the head gets first crack at foods being swept into the pool from above. 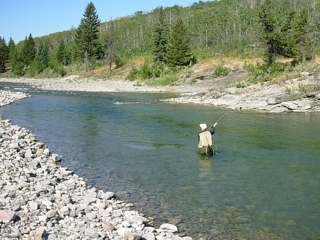 For fly fishermen, the head is a choice location for nymphing, replicating the subsurface insect stages that tumble downstream before sinking into the deeper waters of the pool. 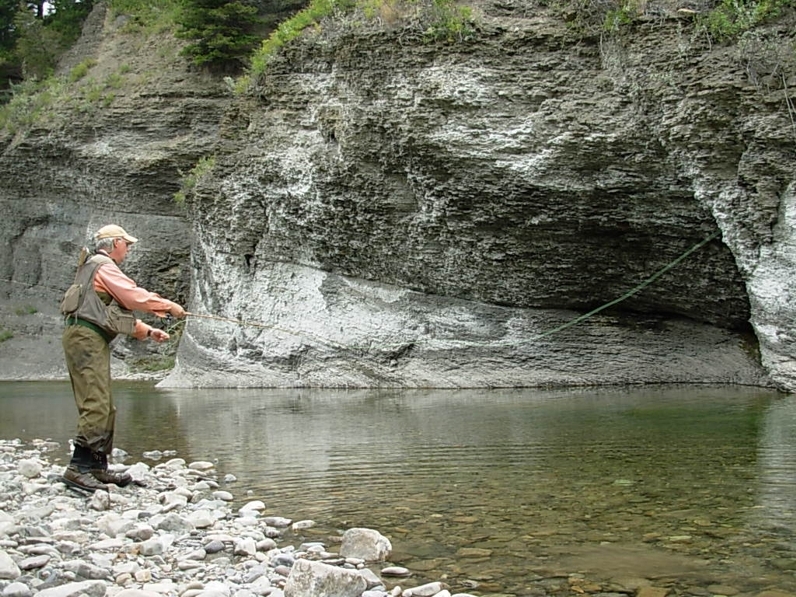 Having said that, dry fly anglers, too, should cover pool headwaters carefully. The tail of the pool is an often overlooked stretch of water that can hold significant numbers of fish. Too often, inexperienced anglers want to rush to the centre or head of a pool, and they end up spooking trout holding in the tail and upsetting the entire pool. Take your time and fish the tail carefully, before moving up through the rest of the pool. Trout will feed in remarkably shallow water at the tail of a pool, particularly when taking food off the surface. Seams– Seams, or edges, are where two currents meet. 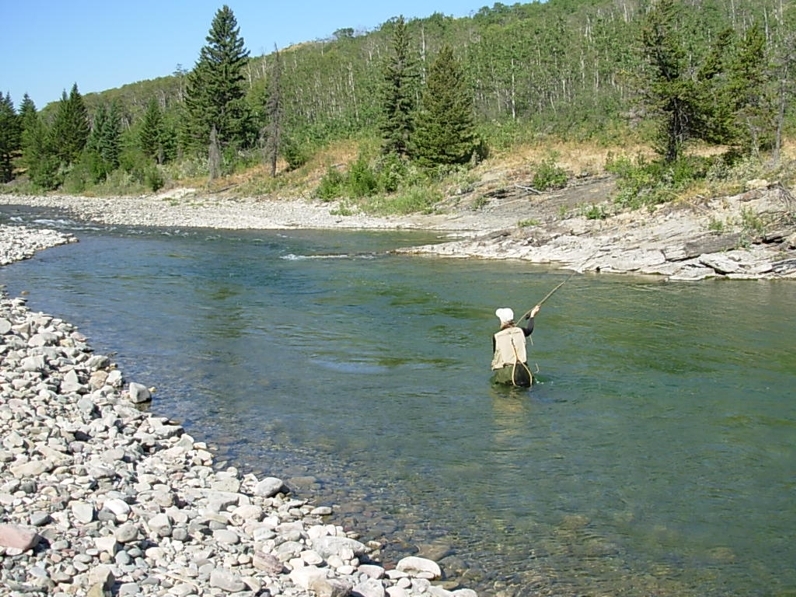 Trout will situate themselves along the edge in the calmer of the two currents, zipping out into the faster section to pick up a quick meal before darting back to the slower side. Present your lure as close to the seam edge, on the quicker side, as you can. 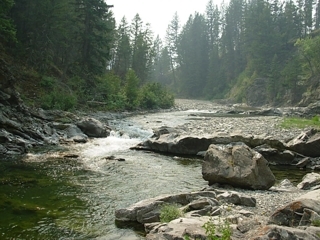 Riffles– Riffles are really just little rapids, often a result of a narrowing of the stream channel, and can be productive trout waters. The choppy surface water helps trout feel secure, and rocks and other bottom structure gives them a place to get out of the current. 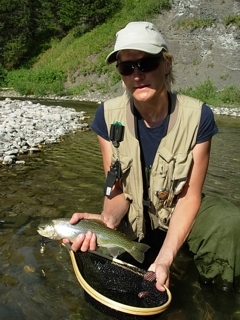 Riffles are prime locations for actively feeding trout, and are always worth covering thoroughly. 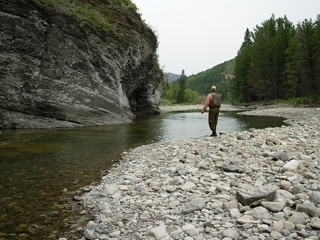 Banks- Undercut banks, where they exist, often provide the best of all worlds for trout. They offer cover from above, are generally out of the faster currents, yet have easy access to currents and prime feeding opportunities. 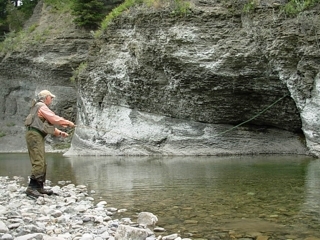 Fly fisherman often enjoy good success by working streamers along undercut banks, as do traditional anglers when casting spinners. 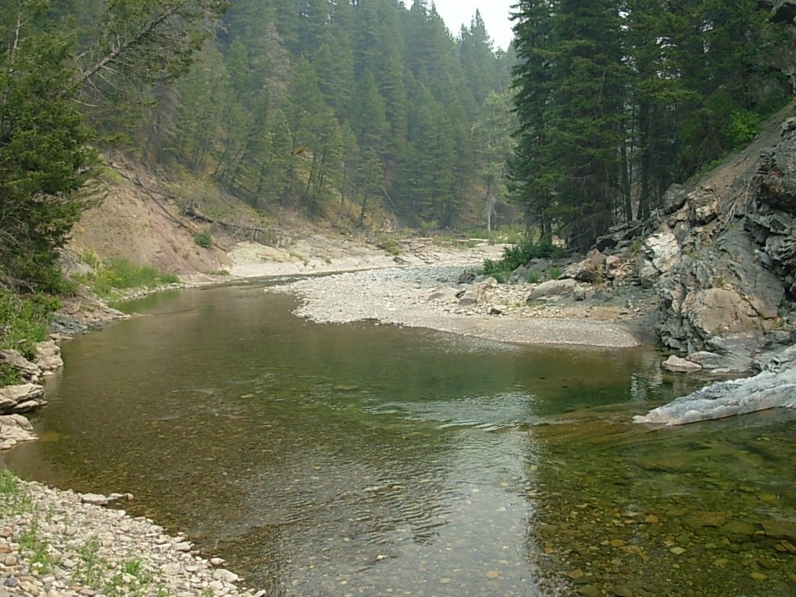 If you want to fish dry flies here, remember to keep them a couple feet away from the bank, as a trout holding in an undercut bank, often can’t see the water’s surface immediately adjacent to the bank. Bank Extensions– These are often rock ledges, boulder piles, or fallen trees. Theses all create slow water adjacent to faster water, and as we know that can be a magnet for hungry trout. Often these obstructions create a back eddy, so it can pay to fish both sides of the obstruction, not just along the fast water side. 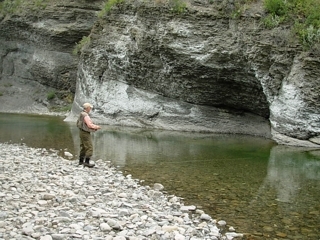 Rocks– Mid stream rocks can, and do, hold trout, offering them a lie that allows them protection from faster current. The way foods travel around these midstream obstructions, however, can vary greatly from site to site. As a result, I don’t spend a lot of time fishing these locations and many that look “fishy”, simply don’t hold trout. A cast or two and I’m out of there. Runs– A run is generally located downstream of a rapid or riffle. The surface looks “slick”, but you can tell the water is relatively deep, a result of currents digging down into the stream bed. 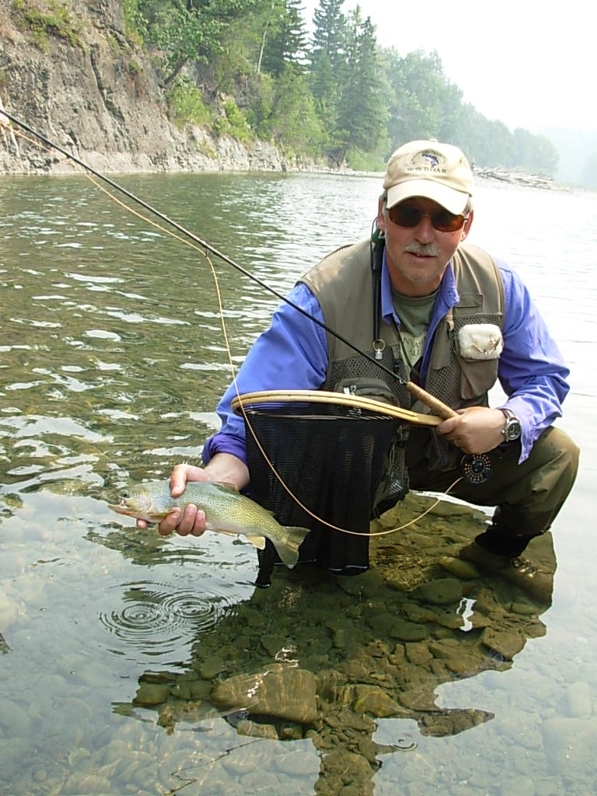 Slower moving runs can be extremely productive lies, and are especially popular with dry fly fisherman. The calmer surface water allows trout holding at the bottom, to see insects floating downstream. At times trout will use just about every aspect of their stream homes – this is particularly true in low light conditions or on overcast days, when they feel less exposed to predators. They are, however, like most creatures, pretty predictable in how, when and where they utilize the habitat available to them. 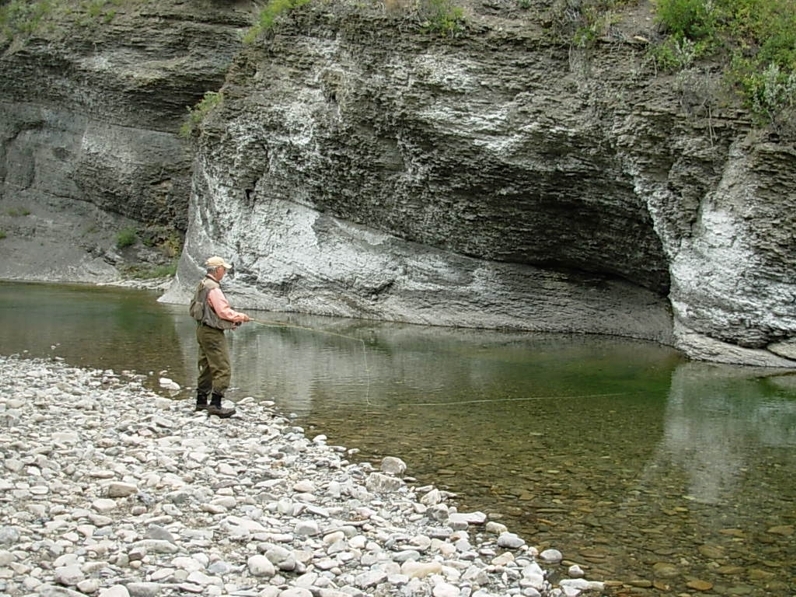 Learning to identify what habitat niches they prefer to use within a stream will allow you to maximize your fishing time in the most productive waters. In the end, it means less prospecting, and a whole lot more fun.